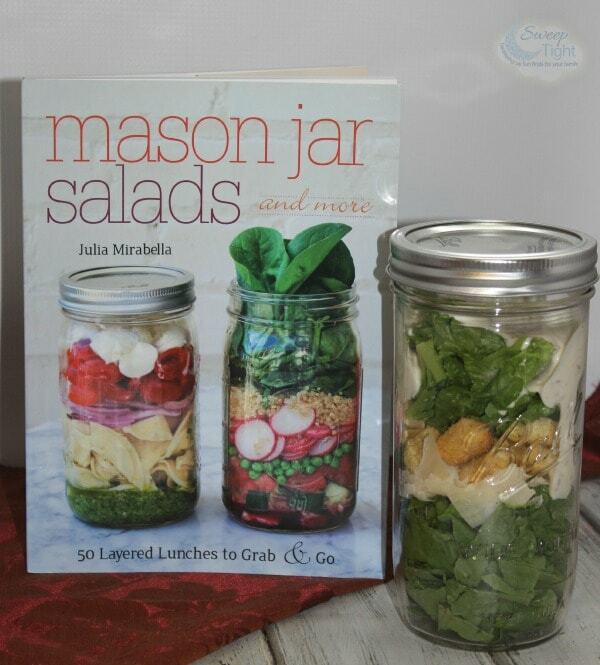 Mason Jar Salads and more by Julia Mirabella is a colorful and lovely book containing 50 layered lunches to grab and go. I received a copy for review, but all opinions are my own. Mason jar meals are huge right now. People have gotten so creative with mason jars and they seem to be everywhere lately. This post also contains affiliate links. I made a delicious caesar salad from the book. It’s just one of the many tasty recipes that I cannot wait to make. Using a mason jar to hold your food makes a lot of sense. Sure, they are great to create pretty layers, but there are more reasons why mason jars rock. Why Use a Mason Jar? Glass – Storing your food in glass is best since it is not porous and will not absorb germs. Affordable – Mason jars are not that expensive. You can get 12 of them for about $15. Time-saving – Create all your lunches for the week at once. Just take some time on a Sunday and line them up in the fridge for the week. Portion control – Ideal way to control your portions. A mason jar can only hold so much. Airtight seal – Once you screw the top on it’s airtight. No worries about spillage. Easy cleanup – They can be cleaned in the dishwasher, so it doesn’t get much easier than that. 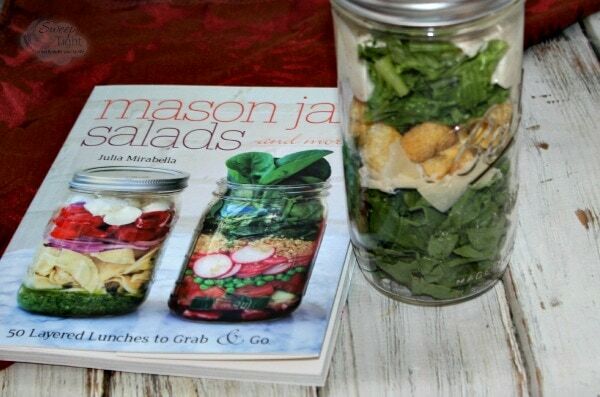 Mason Jar Salads and more contains several recipes including, salads, smoothies, rice, pasta, oatmeal and even more. They are all beautifully-assembled in layers, nutrient-packed, and just scrumptious-looking. I didn’t get all that adventurous with my caesar salad, but it was still darn good. Using romaine lettuce, shaved Parmigiano-Reggiano cheese, croutons, and dressing, it was super tasty and the portion was perfect for me. This book is a great addition to anyone’s cookbook collection. It will provide you with so many new lunch ideas and flavor combinations. Stop eating boring lunches each day and layer up some deliciousness from Mason Jar Salads and more! My husband loves to drink from large Mason Jars, so our cabinets are full of them. I keep the lids in a drawer for my own use. Since I do more than drink from them, it’s good to keep the lids. I’ve been making overnight oatmeal for breakfast and layered salads for lunches. Since I’m on a mission to meal plan each week, these are two meals that are easily crossed off the list using Mason Jars. For the oatmeal and salads I do no more than three days at a time. I find any longer than that, the foods get soggy. But, planning out three days is helpful when you have a hectic schedule during the week. I highly recommend using Mason Jars to help you meal plan. If you like this post, please share it on social media. Don’t forget to subscribe to the blog for more articles like this one. 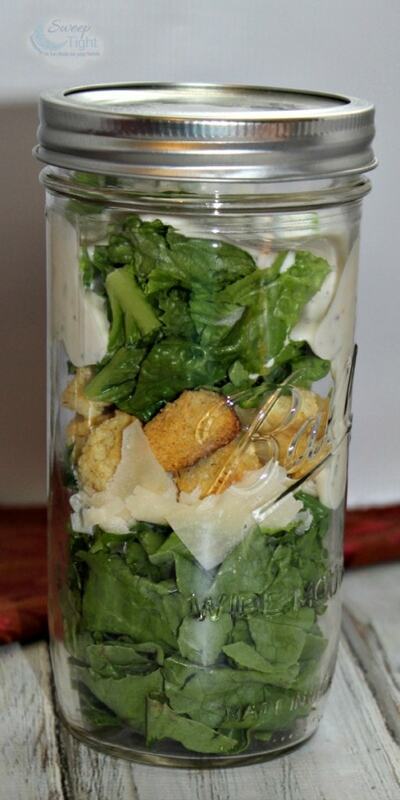 Let us know in the comments if you have any Mason Jar salad suggestions. Do you use Mason Jars? Have you ever used them for meal planning? I looked at the reviews and I think I like that the book has easy recipes and gives you all the information you need like jar size. This looks really good. I love that its’ in a mason jar. I can just shake it up and get my salad dressing all over it. Awesome. This is a great idea! I’d eat more salads if I just had to grab it out of the fridge and go. I think I could handle putting them together all at once on the weekend and then having it ready. I like the idea of breakfast too (oatmeal at least) as I’m busy in the mornings. I love that it is the Kindle Edition. Now I just need to go out a buy a bunch of mason jars! Thanks for sharing, it’s such a good idea.